This craft will remind your kids that they can share the messages of the Gospel with all of their friends. They can learn to spread the message of Jesus’ sacrifice on the cross for the atonement of our sins. Cut out the bottom of a 16 oz. paper or styrofoam cup. Wrap the template around the paper or styrofoam cup. Hold it together with two paper clips and then glue it in place. Cut off any excess overhang of the paper wrapped around the cup. With a one hole punch, punch two holes on opposite sides of the bottom of the cup. Tie a piece of yarn around both holes creating a neck strap. Finally decorate the cup. I have included the words “Jesus Saves”. You can also use glitter, stickers or paint. Let your kids use their imagination. 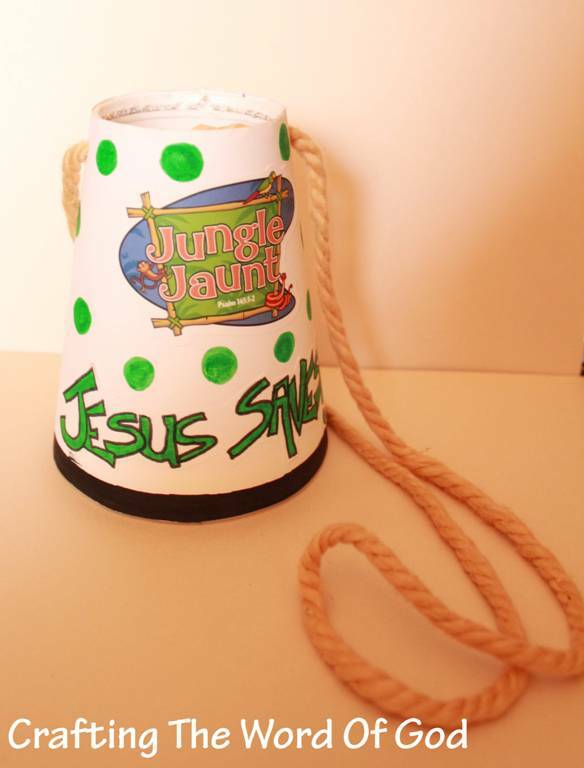 This entry was posted in Bible Crafts, Church, Jesus, NT Crafts and tagged bible crafts, craft, crafts, friends, gospel, Him, Jesus, megaphone, preach, proclaim, share.